You can now purchase the new In Color stamp sets now before the catalog goes live in June. You can purchase them in a bundle and save 10%! Aren't they gorgeous? Also available now is the Share What You Love Suite. 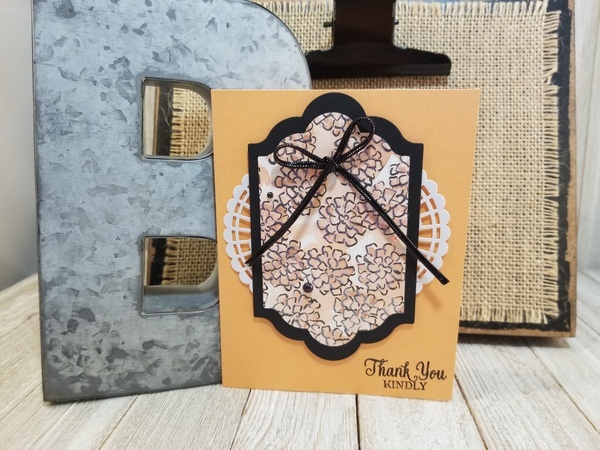 You can view the video that Stampin' Up! has put out and see the pdf. You can't see from the photos but this designer paper is gorgeous with pearlized accents. 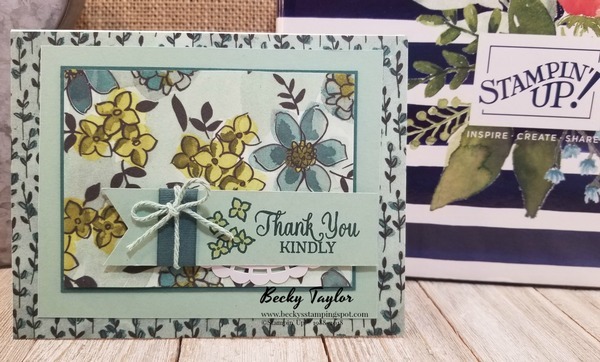 I love this paper and the fact that Stampin' Up! doubled the size of the paper pack (24 12x12 sheets). I will be making a lot of cards out of this paper and it is a heavy weight paper so could easily make 3-D items as well! I will be closing out my April host code tomorrow night so if you are placing an order today or tomorrow, please use the host code HY7EQVS3 if your order is below $150 and I'll enter you to win host prizes from me. Tomorrow, demonstrators will be able to Preorder some items from the new catalog. If you are interested in getting items early, grab a Starter kit tomorrow and fill it with new products from the new catalog! You can choose $125 worth of products for just $99 (plus tax, shipping is FREE). Stampin' Up! will also send you free catalogs, a Paper Pumpkin kit and other business materials. You will then receive 20% off all future orders. You don't have to do anything else! No further obligation and you'll receive your discount until the end of September. Of course, if you want to continue past that time, you certainly can. I'd love to have you on my team! 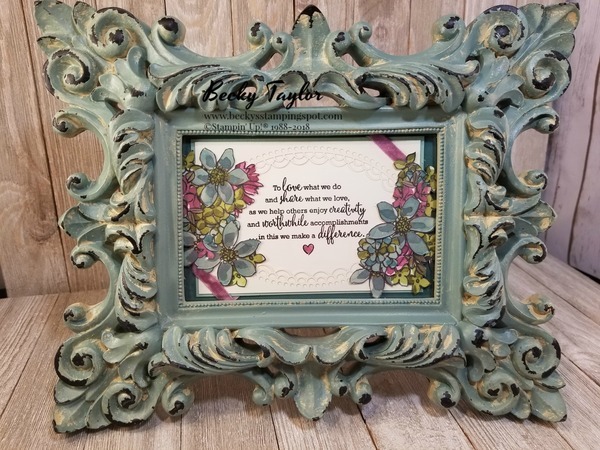 I found this frame at Hobby Lobby and thought it would match the Designer Series Paper in the Suite. I chose a background of MInt Macaron (yay! It's coming back in the new catalog) layered over Tranquil Tide. The lacy oval is from the Delightfully Detailed Laser-Cut Specialty Paper. This laser-cut paper is gorgeous and very delicate. You get 8 sheets of paper in 2 different designs and one design is a sheet with 6 different patterns that can be cut out for card fronts--easy peasy! NOTE: This Laser-Cut paper will not be available until June 2 when the catalog goes live. I stamped the Statement onto Very Vanilla cardstock and then layered the lacy oval on top. I colored in the heart using ink from the top of my Rich Razzleberry ink pad. All of the flowers surrounding my piece are fussy cut from different sheets of paper in the Share What You Love DSP (this paper is more expensive but is a heavier weight and comes with 24 sheets of 12 x 12 paper instead of the usual 12). There are loads of pearlized accents on this paper! This year is the 30th anniversary of Stampin' Up! and the gift for 30 years is pearls! So there are a lot of pearl accents, colored pearls and more in the new catalog. Beginning May 1 (that's this Tuesday!) you will be able to purchase several bundles showcasing the Share What You Love Suite. Each bundle comes with something free! The Pearlized Doilies are a pearlized white on one side and plain on the back. I have sponged color on the back side to use on cards needing some color so they are very versatile. To get the gorgeous Share What You Love Designer Paper you have to purchase the Gotta Have It All Bundle. Otherwise, you'll have to wait until June 2, when the new catalog goes live. And the Statement of My Heart Stamp will not be available except in this bundle. Once the ordering period (May 1-31) is over, this stamp will not be available. In a hurry to get those new In Color stamp pads? You can preorder them now before the catalog goes live on June ! You can purchase the 5 new In Color ink pads in a bundle for $33.75 and save 10%! Check back in a day or two and I'll be sharing the thank you cards I am sending out to my customers for their orders this past month. They will all be featuring this gorgeous paper. This month's host code HY7EQVS3 will be ending and I will close out the order on May 2. If you place an order of below $150 and use this host code, you will be entered to win a new Grapefuit Grove stamp pad (if you order one of the above bundles and will already be getting the ink pad, I will send you something else of greater value).